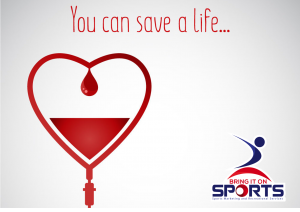 Save lives with Bring it on Sports and the Red Cross! Bring it on Sports are proudly helping to save lives by joining the successful Australian Red Cross Blood Service’s socially responsible program called Red25: United To Save Lives. Only 1 in 30 Australians donate blood but 1 in 3 Australians will need blood at some stage in their life. Each donation helps save 3 lives. Red25 is the group donation program of the Australian Red Cross Blood Service with a goal to rally organisations and groups across the country to achieve, together, 25% of the blood donations needed by Australia. JOIN THE BRING IT ON SPORTS RED25 GROUP! The Bring it on Sports Red25 Group includes our staff, clients, family and friends. It’s easy, so join us and together we can help to ensure the patient demand for blood donations is met! Through our participation in Red25 we are looking forward to supporting those in need and hope you will join this initiative.